The report found there was no longer a gender gap among problem gamblers, of whom half were women. And among the 45,000 people with a problem severe enough to be considered a gambling addiction, 64% were women. That is up from just 18% in 2015 - with the surge widely being attributed to the increase in online gambling. The survey of 5,000 people found that overall numbers of problem gamblers had dropped since the last analysis published in 2015. But at the same time, there was a 50% increase in problem gamblers - the category in which the gender gap vanished. The number of women with a gambling problem had been increasing over the past 10 years, the public health agency said. Ulla Romild, the investigator behind the report, said that despite the drop in overall numbers, it was "worrying" that serious problems were increasing "and that we see an increase among women". Why are most UK problem gamblers men? She said that from a public health perspective, the high proportion of female gambling addicts - those with the most severe problem - was not the most important result. 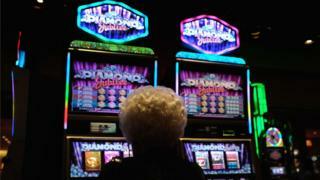 "Our focus is broader than only people being dependent on gambling," she said. "We are more interested in a larger group experiencing harm... a combination of people with moderate risk and gambling problems." That group contains more than 100,000 people - just under 1.5% of Sweden's population. Another 225,000 - just under 3% of the population - have some risk of becoming problem gamblers. One area the report highlights is the increasing amount of gambling done online, and the "new game forms" on the internet which are changing gaming patterns. Professor Anders Håkansson from Lund University - a specialist in gambling addiction - told Radio Sweden that this could be one explanation for the rise in women gambling. "Women who do seek treatment are more likely to report online casino gambling than men do," he said. Men play significantly more poker and bet more on sports and horse racing than women, the figures showed. But that gap narrowed or vanished entirely when it came to playing the lottery, slot machines, or bingo. Since 1 January, Sweden has been operating a new licensing system for gambling and lotteries, and the country is now considering how such games are advertised. Minister for Public Administration Ardalan Shekarabi released a statement alongside the report promising to "put an end to the aggressive game advertising". The gambling industry had proposed a form of self-regulation, but Mr Shekarabi said on Wednesday that it "will not be sufficient." "More needs to be done so that those who are most vulnerable in the market are protected," he said. In the UK, the gambling commission says men are far more likely to have gambling problems - 0.9% compared with 0.1% of the population. In the US, the gap between male and female gamblers is narrowing, according the National Council on Problem gaming – and women even outnumber men in the 45-64 age group.